Boxed in Time New Head! Many of these hands apart from those of dolls are the hands of Fatima. 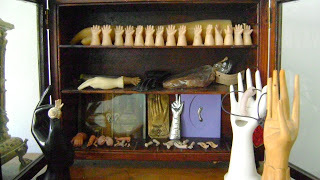 My favorite of which is the large wax hand on the top shelf behind the waving plastic ones. sed in Tavira ,Portugal. It is designed to encourage St Fatima to heal any ills your own hand might have. The trick is to approach the shrine of Fatima on your knees holding out the wax hand before you. 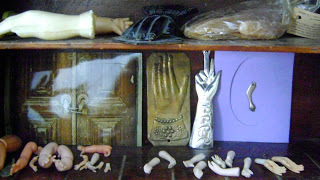 There were many other body parts available fashioned in wax for the same purpose. Feet,breasts,noses etc.. This wonderful store which sold all manner of Catholic statues agreed to sell me all their spare hands. The ones that had fallen of statues of Christ or the saints. 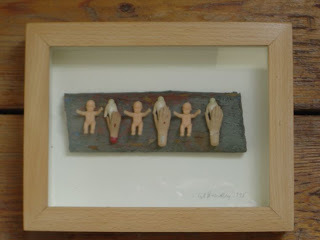 Some of these remain in the cabinet but most became incorporated into a series of Assemblages I made during my visits to Tavira in the mid 90′s. 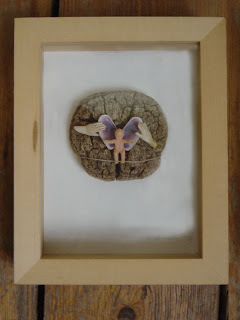 Finds from the flotsam and jetsam of Cacela Velha beach also feature.